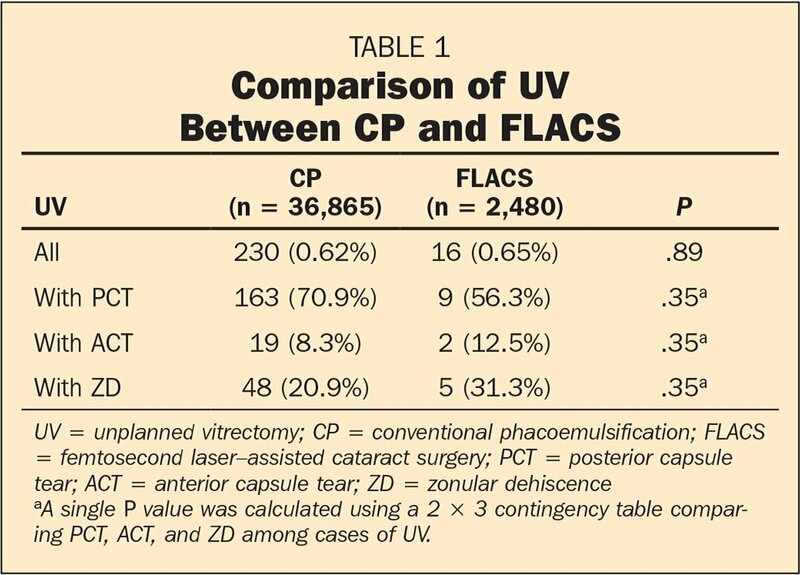 To assess the rate of unplanned vitrectomies with femtosecond laser–assisted cataract surgery (FLACS) compared to conventional phacoemulsification at a single, high-volume, multi-surgeon ambulatory surgical center. Retrospective, comparative study of phacoemulsification cases performed in a community-based ambulatory surgical center. A chart review of 2,480 consecutive FLACS procedures performed by 30 surgeons and 36,865 consecutive conventional phacoemulsification surgeries performed by 47 surgeons was conducted. The rate of unplanned vitrectomies was evaluated. In eyes with unplanned vitrectomy, the rates of posterior capsule tear, anterior capsule tear, and zonular dehiscence were analyzed. The unplanned vitrectomy rates between early and late FLACS cases were compared using thresholds of greater than 10, 20, and 50 cases. There were 230 (0.62%) and 16 (0.65%) unplanned vitrectomies in the conventional phacoemulsification and FLACS groups, respectively (P = .89). Of the cases requiring unplanned vitrectomy, posterior capsule tear, anterior capsule tear, and zonular dehiscence rates (conventional phacoemulsification vs FLACS) were 70.9% versus 56.3%, 8.3% versus 12.5%, and 20.9% versus 31.3%, respectively (P = .35). The difference in unplanned vitrectomy rates between early and late cases did not reach statistical significance in any threshold group. FLACS had a rate of unplanned vitrectomy comparable to conventional phacoemulsification. There was no statistically significant difference in unplanned vitrectomy rates between early and late FLACS cases suggesting a short learning curve. The femtosecond laser confers a precision and reproducibility to tissue cutting during cataract surgery beyond that attainable using conventional phacoemulsification techniques. This includes fragmentation of the crystalline lens, creation of the anterior lens capsulotomy, arcuate incisions for astigmatism, and clear corneal wound construction. Laser fragmentation of the lens produces a softening effect reducing phacoemulsification time and endothelial cell loss.1–3 Compared to manual capsulorhexes, capsulotomies created with the laser have better circularity and geometry,4–6 which may improve refractive stability and predictability by ensuring proper positioning of the intraocular lens.7–9 Consistency in fashioning an optimal corneal wound architecture may further enable increased refractive predictability and reduce the risk of postoperative wound leak and endophthalmitis.10,11 It has been hypothesized that these attributes may enhance outcomes and improve safety by reducing some of the variability and potential for error introduced with manual incisions during conventional phacoemulsification. This study compared the rates of unplanned vitrectomy between femtosecond laser–assisted cataract surgery (FLACS) and conventional phacoemulsification. We subclassified unplanned vitrectomy by the associated precipitating event: anterior capsular tear, posterior capsular tear, or zonular dehiscence. A review of consecutive conventional phacoemulsification surgeries and FLACS was performed at a single, multi-surgeon ambulatory surgical center between October 2009 and September 2015. This study was approved by a national institutional review board (Quorum, Olympia, WA) and followed the tenets of the Declaration of Helsinki. All cataract surgery cases involving unplanned vitrectomy during the study period were identified by accessing the surgical center's quality improvement reports. The operative report and quality improvement report of each case were reviewed to identify the circumstances that led to vitreous loss. Information collected on precipitating events included posterior capsule tear, anterior capsule tear, and zonular dehiscence. Cases involving a combined procedure in which the cataract surgery component did not occur first (eg, open-sky cataract surgery combined with penetrating keratoplasty) were excluded from the analysis. Phacoemulsification was completed with the Infiniti Vision System (Alcon Laboratories, Inc, Fort Worth, TX) on cases performed before October 2014, and subsequently with the Centurion Vision System (Alcon Laboratories, Inc.). The Catalys Precision Laser System (Johnson & Johnson Vision, Inc., Santa Ana, CA) was used in all eyes undergoing FLACS. Specific parameters of laser treatment, including capsulotomy size and positioning, lens fragmentation patterns, posterior capsule safety zone, and corneal incisions, were customized at the discretion of the individual surgeon. The rate of unplanned vitrectomy was determined for the conventional phacoemulsification and FLACS groups. In eyes undergoing unplanned vitrectomy, the frequencies of posterior capsule tear, anterior capsule tear, and zonular dehiscence were assessed. The Fisher's exact test was used to analyze categorical data using StatXact version 10 software (Cytel Inc., Cambridge, MA). Probabilities of less than 5% (P < .05) were considered significant. As an indirect assessment of whether the rate of vitreous loss is influenced by the level of surgeon experience, the unplanned vitrectomy rates of early FLACS cases were compared to later cases. Early cases were defined as the first 10 (analysis 1), 20 (analysis 2), or 50 (analysis 3) cases. A total of 36,865 consecutive conventional phacoemulsification surgeries were performed by 47 different surgeons during the study period. A total of 2,480 consecutive FLACS procedures had been performed by 30 surgeons since the apparatus was acquired in December 2012. Table 1 shows the rate of intraoperative complications. The rates of vitreous loss in the conventional phacoemulsification and FLACS groups were nearly equivalent at 0.624% and 0.645%, respectively (P = .89). Analysis with the Fisher's exact test using a 2 × 3 contingency table determined there was no statistically significant difference in the rate of unplanned vitrectomy associated with posterior capsule tear, anterior capsule tear, and zonular dehiscence (P = .35). Three analyses of change in the rate of unplanned vitrectomy with surgeon experience were performed, with “early” cases defined as the first 10 (analysis 1), 20 (analysis 2), or 50 (analysis 3) procedures. The number of surgeons who completed more than 10, 20, or 50 FLACS procedures was 23 (76.7%), 22 (73.3%), and 12 (40.0%), respectively. There was no statistically significant difference in the rate of unplanned vitrectomy between early and late FLACS cases in analysis 1, 2, or 3 (Table 2). In this retrospective, comparative analysis, we evaluated the safety of FLACS with respect to unplanned vitrectomy. We identified a nearly equivalent rate of unplanned vitrectomies between the FLACS and conventional phacoemulsification groups. Moreover, comparison of early and late FLACS cases did not reveal higher unplanned vitrectomy rates during early cases, suggesting good safety among experienced cataract surgeons transitioning to this technology. Vitreous loss is an infrequent but serious intraoperative complication of cataract surgery that is associated with an increased risk of poor visual outcomes.21 Anterior prolapse of the vitreous primarily occurs following one of three intraoperative events: posterior capsule tear, anterior capsule tear with extension to the posterior capsule, or zonular dehiscence. Published series have consistently reported vitreous loss rates of 1% to 4% with conventional phacoemulsification.22,23 Few studies have directly compared vitreous loss during conventional phacoemulsification and FLACS. Among these, the rates of vitreous loss appear similar between conventional phacoemulsification and FLACS or lower for FLACS.23–25 In their large retrospective series, Scott et al.23 observed a significant reduction in vitreous loss with FLACS (0.65%) compared to conventional phacoemulsification (1.17%) in a community-based surgery center. However, there was no description of associated capsular complications. Another recent study sourced from the multinational European Registry of Quality Outcomes for Cataract and Refractive Surgery (EUREQUO)25 reported a lower vitreous loss rate with FLACS (0.1%) than with conventional phacoemulsification (0.3%), although this did not reach statistical significance. A posterior capsule tear rate of 0.6% was observed in each group. Figures for other specific capsular complications could not be determined, but appear to be no higher than 0.5% and 0.8% in the FLACS and conventional phacoemulsification groups, respectively. Although there was no significant difference in unplanned vitrectomy rates between conventional phacoemulsification and FLACS in this study, it is remarkable to note the low rate of unplanned vitrectomy in this large cohort of conventional phacoemulsification cases performed by a diverse group of surgeons from the community. Similarly, the EUREQUO unplanned vitrectomy rates with conventional phacoemulsification appear exceptionally low. These rates compare favorably to many other published reports that have been previously reviewed.22,23 We speculate that this may reflect a trend toward safer cataract surgery overall, perhaps via improved education and training and/or advances in phacoemulsification machine fluidics. Reports of increased rates of anterior capsule tear and tags with FLACS, thought to be related to the ser-rated morphology of the femtosecond capsulotomy edge visible under electron microscopy, have been a source of concern. In a prospective trial by Abell et al.,26 the occurrence of anterior capsule tear was significantly higher with FLACS (1.84%) compared to conventional phacoemulsification (0.22%), although only a single case in each group required anterior vitrectomy. In contrast, others have published substantially lower anterior capsule tear rates with FLACS. In a series of 1,000 cases, Day et al.27 reported 1 case of an anterior radial tear (0.1%) that did not extend to the posterior capsule. After excluding their initial 200 cases designated as part of their learning curve, Roberts et al.28 experienced a capsular complication rate of 0.62% (4 each of anterior capsule tear and posterior capsule tear) and an unplanned vitrectomy rate of 0.31% (1 with anterior capsule tear and 3 with posterior capsule tear) in their subsequent 1,300 cases. In porcine eyes, comparative studies between femtosecond laser–created capsulotomies and manual capsulorhexes have demonstrated higher tensile strength with the former.5,29 However, in a recent study of paired, explanted capsules of human eyes, the strength of femtosecond laser–created capsulotomies was similar to that of manual capsulorhexes.30 These data suggest that femtosecond laser–created capsulotomies are in general at least as strong as manual capsulorhexes, and that anterior capsule tear is not only uncommon, but also infrequently leads to unplanned vitrectomy. Several studies have reported a temporary increase in complications in the earliest subset of FLACS cases. In their first 200 cases, Roberts et al.28 published an overall capsular complication rate of 7.5% and unplanned vitrectomy rate of 5%. They experienced a significant reduction of these complications in the following 1,300 cases, with a rate of 0.62% and 0.31%, respectively. Similarly, Nagy et al.31 reported complications occurring in only the first 100 of 1,230 cases, none of which required vitrectomy. In contrast, Scott et al.23 reported a lack of any unplanned vitrectomy cases during the first month of their conversion to FLACS and a significant decrease in overall unplanned vitrectomy rates compared to conventional phacoemulsification, suggesting a steep learning curve. Among the surgeons in our study, there was no significant difference in vitreous loss rates between early and late cases when using a threshold of 10, 20, or 50 cases. In fact, among all surgeons who had completed more than 10 and more than 20 FLACS cases at the time of this study, only one surgeon experienced unplanned vitrectomy in the early cases. Additionally, there were no unplanned vitrectomy events with the 7 surgeons who had completed a total of 10 or fewer cases. Although transitioning to FLACS requires some adaptation and adjustments in surgical technique, the evidence indicates that this learning curve is short and readily surmountable. Due to limitations in the available data, it was not possible to ascertain overall rates of specific complications in the absence of unplanned vitrectomy. It is likely the overall capsular complication rate was higher. In the presence of minor capsular damage, the surgery may often proceed with minimal adjustment to technique and normal implantation of the intraocular lens within the capsular bag. The aim of this study was to identify the rate of unplanned vitrectomy, an event that typically indicates that a surgery has transitioned from routine to a more complex and prolonged procedure with the potential for more significant injury to the eye. Additionally, comorbidities such as floppy iris syndrome, pseudoexfoliation, previous trauma, and hypermature cataract may increase the risk of capsular complications. However, because the operative reports of the surgeons do not consistently document the presence of comorbidities, we are unable to determine whether a difference in their frequencies within the two study groups could have influenced the unplanned vitrectomy rates. Prospective studies are needed to address such potential biases. Our study included cases from a large number of surgeons, with varying degrees of experience and surgical volume, from a wide variety of practice settings. With respect to unplanned vitrectomy, the safety of FLACS appears comparable to conventional phacoemulsification surgery. We were unable to ascertain the overall rate of capsular complications in the absence of unplanned vitrectomy in this study, but in cases that progressed to unplanned vitrectomy, the types of capsular complications that occurred with FLACS were similar to conventional phacoemulsification. Overall, transitioning to and developing proficiency with FLACS appears to be readily achievable by experienced cataract surgeons. Chang DF. Cataract surgery complication rates: how are we doing?Cataract & Refract Surg Today. February2012:53–6. Available at: http://crstoday.com/2012/02/cataract-surgery-complication-rates-how-are-we-doing/. Accessed April 15, 2017. Chen M, Swinney C, Chen M. Comparing the intraoperative complication rate of femtosecond laser-assisted cataract surgery to traditional phacoemulsification. Int J Ophthalmol. 2015;8:201–203. From Massachusetts Eye and Ear Infirmary, Boston, Massachusetts (CS, KMH, JHT); the Department of Ophthalmology, Harvard Medical School, Boston, Massachusetts (CS, KMH, JHT); Boston University School of Medicine, Boston, Massachusetts (CJB); and SurgiSite Boston, Boston, Massachusetts (GCG). Mr. Grassett has consulted for Johnson & Johnson Vision, Inc. Dr. Hatch is a consultant to Johnson & Johnson Vision, Inc. Dr. Talamo was a consultant to Johnson & Johnson Vision, Inc. and is now an employee of Johnson & Johnson Vision, Inc. The remaining authors have no proprietary or financial interest in the materials presented herein. Supported by an unrestricted grant from Johnson & Johnson Vision, Santa Ana, California; Harvard Catalyst/The Harvard Clinical and Translational Science Center (National Center for Advancing Translational Sciences, National Institutes of Health Award UL 1TR002541); and financial contributions from Harvard University and its affiliated academic health care centers.